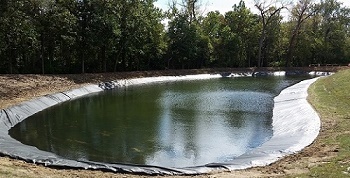 Western Environmental Liner creates custom-fabricated fish pond liners for ponds that are generally 10,000 square feet or larger. To create a fish pond, before you even start work your most crucial decision is the pond liner. Obviously, you can't have the water draining away, and you want a liner that will last for a very long time so you don’t have to disturb the pond environment. Ideally you want the freedom to fit your pond to your topography and landscape design, without having to install a pre-shaped liner. You also want to go as deep as necessary - at least 4 feet for a Koi pond, for example, and often much deeper. Light enough to work with easily. Very strong and not prone to stretching. NON-TOXIC to aquatic life and plants. Highly resistant to UV deterioration. Durable enough to last for decades. For larger ponds, Reinforced Polyethylene (RPE) is often the material that best fits all of these criteria. RPE fish pond liners are the lightest, strongest and most durable of the flexible materials used today - strong enough that they don't require any underlayment, so one liner is sufficient. While RPE pieces can be heat-welded in the field, the best liner for any application will always come from a single sheet created in the factory to fit your pond. Western Liner is one of the largest manufacturers of RPE in the world. We have 3 factories in the United States able to create a seamless liner delivered from factory to you, custom measured to your design. Our Aqua series line offers excellent tear resistance and a range of specifications from light to heavy-duty applications. We can help with large pond liners. For smaller size fish ponds, today’s best material is Reinforced Polypropylene (RPP), an excellent product with extra coating that gives the maximum resistance to ulta-violet rays and weathering. Western Liner has been in the business of making liners and covers for over 30 years, growing from our beginnings in agriculture. No job is too large or too small, and custom work for the perfectionist owner or tricky landscape is our specialty. Call us to speak with our liner experts and see how we can deliver the perfect liner for your fish pond.